It’s 4pm and I’m standing in the Whole Foods snack aisle. It must be 95 degrees outside. I didn’t take a nap. Have I mentioned I’m pregnant? Well, I’m tired, hot, hungry, PREGNANT, and irritated by the fact that I can never find the pita chips I’m looking for when I’m at the store. Are they in the chip aisle? Near the deli? On a random end cap near the ethnic foods? On top of all this, the clock is ticking. Friends are scheduled to come over for dinner in approximately 2.5 hours. I have the cherry salsa all worked out, but what the heck will I serve as a dipper? Not only are there no plain pita chips in sight, but nothing else seems right. A tortilla chip won’t fit. No vegetable or fruit will work–no way. A rice cake? A potato chip? Argh. I settle on plain Pop Chips and Stacy’s Parmesan, Garlic & Herb Pita Chips. Not ideal at all, but it’s what I have in my sights and given my current condition it will have to work. And guess what? Cherry salsa tastes delicious with Pop Chips and garlicky pita chips. I’m convinced fruit salsas are to appetizers what pizzas are to the main course. Even a bad pizza tastes good…and the same goes for salsa. 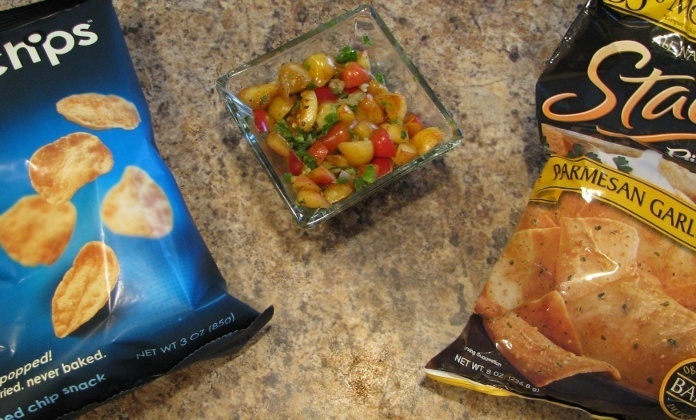 Whether it’s mango salsa, strawberry salsa, or cherry salsa, your taste buds will be glad you ate it, even if you do serve the salsa with a dipper that just seems all wrong. The following is based on a Bon Appetit recipe. 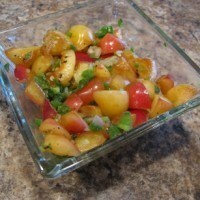 A simple fruit salsa featuring cherries. Throw it in a bowl. 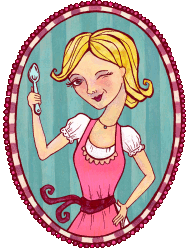 The ice cream comes into play almost every day around 8…sometimes earlier! I love salty/sweet/spicy combos. I always have cherries in the fridge during the summer. I’m going to have to use some of them for this salsa. I never have Popchips. They don’t last that long around here. Hope you are feeling well. Can’t wait to meet your little dipper! Karen, I love “the little dipper.” That just might stick! This looks so appetizing and flavoursome! A perfect treat during those hot summer days. Whenever I really NEED to find something at Whole Foods, it’s always mysteriously located on some random end of some random aisle and it takes me HOURS. Sigh. I could totally make this salsa and just eat it straight up out of the bowl. No pita chips necessary. cherry salsa how awesome!! glad it worked out!! thanks for another great dip recipe! I had no idea you were pregnant…congratulations!